Fiscal policy is how the government influences the economy by using taxes or spending to control economic growth. But what are the affects of fiscal policy? You certainly hear the term "fiscal policy" thrown around a lot these days - whether it be in reference to a new tax or budget bill, or regarding political debates and tensions on how the government should or shouldn't be involved in the economy. But, while you may have had a working definition of fiscal policy in your freshman year Econ 101 class, it is important to understand how it works in order to know what is actually happening and affecting change in the economy (and, very likely, in your own pocket). And with fiscal policy seeming to work in a counter-cyclical fashion recently, according to reports in the Washington Post, it's more helpful than ever to know your stuff. So, what is fiscal policy, and how is it used? Boiled down, fiscal policy is what the government employs to influence and balance the economy, using taxes and spending to accomplish this. 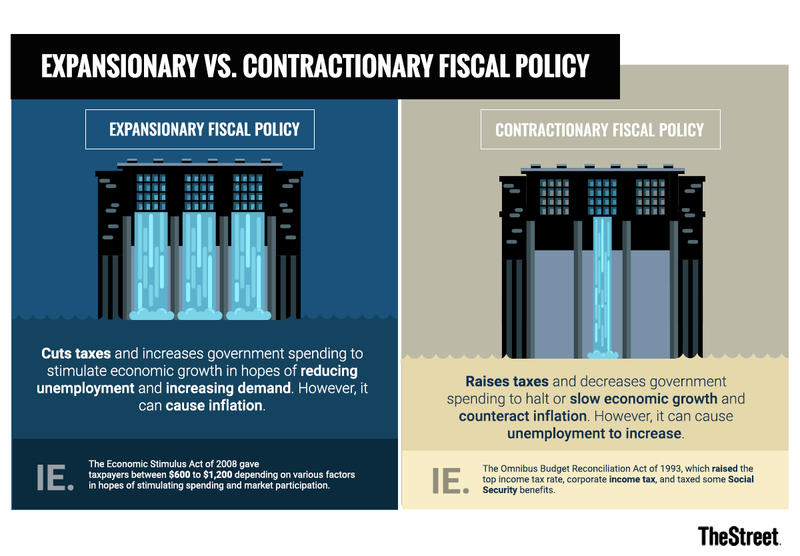 Fiscal policy tries to nudge the economy in different ways through either expansionary or contractionary policy, which try to either increase economic growth through taxes and spending or slow economic growth to cutback inflation, respectively. Basically, fiscal policy intercedes in the business cycle by counteracting issues in an attempt to establish a healthier economy, and uses two tools - taxes and spending - to accomplish this. Fiscal policy is often utilized alongside monetary policy, which involves the banking system, the management of interest rates and the supply of money in circulation. The main goals of fiscal policy are to achieve and maintain full employment, reach a high rate of economic growth, and to keep prices and wages stable. But, fiscal policy is also used to curtail inflation, increase aggregate demand and other macroeconomic issues. In expansionary fiscal policy (which is the most common method employed), the government implements policies that can increase or decrease taxes, spend money on projects to stimulate the economy and increase employment, or increase productivity levels in the economy. Fiscal policy developed out of the Great Depression, which ended the laissez-faire approach to economic management, and began a means of monitoring and influencing macroeconomics through government intervention. To this extent, fiscal policy is designed to try to keep gross domestic product growth at an ideal 2% to 3%, natural unemployment at around 4% to 5%, and inflation at a target rate of around 2%. But how does fiscal policy operate, and what methods does it employ? Separate from monetary policy, fiscal policy mainly focuses on increasing or cutting taxes and increasing or decreasing spending on various projects or areas. But, depending on the signals from the current state of the economy, fiscal policy may focus more on restricting economic growth (often done to mediate inflation), or attempt to expand economic growth by reducing taxes, encouraging borrowing and spending, or spending on projects to stimulate the economy or increase employment. So, what types of fiscal policy accomplish these tasks? Expansionary fiscal policy is used by the government when attempting to balance out the contraction phase of the business cycle (especially when in or on the brink of a recession), and uses methods like cutting taxes or increasing government spending on things like public works in an attempt to stimulate economic growth. Expansionary fiscal policy, therefore, attempts to fix a decrease in demand by giving consumers tax cuts and other incentives to increase their purchasing power (and, how much they spend). The goal behind expansionary fiscal policy is to lower tax rates and increase consumer aggregate demand, which will increase demand for products, requiring businesses to hire more employees to support the higher demand - and thus, increase employment. For example, the Economic Stimulus Act of 2008 gave taxpayers between $600 to $1,200 depending on various factors in hopes of stimulating spending and market participation - the whole package of which cost the government $152 billion. Or, the government may try to stimulate the economy and increase employment by spending on some public works or benefit programs, like building roads, schools, parks, or the like. Just after the 2008 financial crisis, the government shelled out some serious cash (to the tune of around $831 billion) for the American Recovery and Reinvestment Act of 2009, which, among many objectives, sought to boost infrastructure projects, provide tax cuts, and increase healthcare and education spending to stimulate the economy. But expansionary fiscal policy treads a thin line, needing to balance economic stimulation while keeping inflation as low as possible. For this reason, expansionary is sometimes detrimental to the economy. For example, if the government decides to lower tax rates to foster more spending, an influx of cash and demand may increase inflation, which will decrease the value of the money. For this reason, the other side of fiscal policy is, unsurprisingly, contractionary. On the other hand, contractionary fiscal policy entails increasing tax rates and decreasing government spending in hopes of slowing economic growth for various reasons. In this way, the government may deem it necessary to halt or deter economic growth if inflation caused by increased supply and demand of cash gets out of hand. In this manner, contractionary fiscal policy reduces the amount of money in circulation, and, therefore - the amount available for consumers to spend. If an economy is booming and growing too rapidly (as may be caused by expansionary fiscal policy) - which, according to normal rates, should be no more than 3% per year - contractionary fiscal policy may be required to right it. So, contractionary fiscal policy is often employed when the growth of the economy is unsustainable and is causing inflation, high investment prices, unemployment below healthy levels and recession. However, because the point of contractionary fiscal policy is to reduce the amount of money in circulation and allow the economy to grow at a healthier rate, it is often very unpopular due to how it generally increases taxes, cuts or reduces subsidy and welfare programs, or cuts government jobs. And, this unpopularity often leads to an increase in the budget deficit via the government issuing more treasury bonds - which, given the imbalance of GDP to debt, will cause interest rates to increase due to how holders of the treasury bonds become anxious over not being repaid by the indebted government. Still, increased interest rates simply perpetuate many of the problems. Among a few others, President Bill Clinton employed contractionary monetary policy during his presidency by enacting the Omnibus Budget Reconciliation Act of 1993, also known as the Deficit Reduction Act, that raised the top income tax rate to 36% from 28% for those earning over $115,000 per year, as well as increased corporate income tax and taxed some Social Security benefits. Still, both contractionary and expansionary fiscal policies have never been fully effective, as the United States continues to operate under a huge budget deficit. The central idea behind fiscal policy is that, by manipulating spending and taxation, the government can either stimulate consumption and investment or slow it down (depending on the market signals). In this manner, the government uses fiscal policy to lower personal or corporate taxes to encourage consumer spending or investment, and, vice versa, raises taxes and cuts spending to slow it. But there are several other ways fiscal policy is put to work in the economy. One way the government uses fiscal policy is to stimulate the economy if it ascertains that business activity is lagging - and spends more to stir up the economy (called "stimulus" spending). However, if the government doesn't have enough cash to fund its own spending, it will often borrow money in the form of issuing government bonds (or treasury bonds) - debt securities - and, thus, spends the funds under this debt. This is often referred to as "deficit" spending, and is one of the major ways the government uses fiscal policy. While the motivations for using fiscal policy may vary, it is often employed after a depression, recession, or during times of economic stagnation (or heightened inflation). While fiscal policy deals mostly with government legislation regarding taxes and spending, monetary policy attempts to control economic growth (whether to stimulate or slow down) by managing interest rates and the supply of money in the economy. Similar to fiscal policy, it operates to either stimulate or curtail the economy. Monetary policy largely uses central banks or the Federal Reserve to restrict or increase money supply in circulation - using various strategies. The Federal Reserve uses either open market operations (selling or buying government bonds to affect the amount of money in circulation), setting a discount rate (by which it intends to affect interest rates by setting new ones for lending to financial institutions), or changing the reserve ratio for banks (in order to increase or reduce the amount of money banks can create when making loans). In a similar fashion to fiscal policy, monetary policy can either be lose or tight (in other words, expansionary or contractionary) by either decreasing interest rates and making credit cheaper or increasing them and making credit more expensive. What Is the Impact of Fiscal Policy? Due to the nature of the beast, fiscal policy doesn't always impact everyone the same way - and will often hurt or help a certain demographic more than others. For example, tax cuts to the middle class will certainly help them have a little more cash in their pockets, while increases in taxes for certain tax brackets can sting those in the higher tiers of income (as Clinton's Deficit Reduction Act did). And, while government spending may seem more stratified in its impact, those like laborers and workers may benefit from certain projects, given the employment opportunity it provides. The market also feels the effects of fiscal policy, as the stock market certainly felt the impact of President Trump's election - notably after the 2017 $1.5 trillion U.S. tax bill passed (deemed "The Tax Cuts and Jobs Act"). After its passage, the markets rose, with the Dow Jones Industrial Average (DOW rising 0.4% and the S&P 500 rising 0.3%, according to CNBC. While there are obviously many economic impacts of fiscal policy, there have also been many political and controversial effects. As one of many examples, in 2015, Republicans who dominated Congress and the House proposed a new bill that would "dynamically score" tax and budget bills through fiscal analysis, according to The Huffington Post. But, this raised concerns on the other side. "In the guise of dynamic scoring, Republicans are trying to rig the system in ways that can be very destructive," said Michigan Democrat Sander Levin in a statement in 2015. "The proposed change would undermine fiscal responsibility and further embrace Republican trickle-down economics." And while debates like these go on both sides of the political spectrum, fiscal policy has always been a polarizing issue. Fiscal policy grew out of the ideas of John Maynard Keynes - a British economist in the late 1800s to 1900s - who asserted that the government should be able to use its influence on the economy to balance out the expansion and contraction phases of the business cycle. Keynes asserted that, when there was low activity in the economy, the government should have a budget deficit, while, during times of high activity in the economy, the budget should be a surplus. Essentially, Keynes laid out the basis for fiscal policy by asserting the government could manipulate consumer and investor spending by either expanding or contracting to counteract times of low or high activity. Prior to the 20th century, American economics were largely laissez-faire, meaning little government intervention in the natural flow of the economy. However, Keynes' ideas became a central part of economic theory following one of the largest catastrophes in the American economy - the Great Depression. Through then-President Franklin D. Roosevelt's proposal of the New Deal, government intervention in attempting to end the depression marked a change in economic theory in the United States. In an attempt to stabilize the economy, FDR planned to increase consumer spending and employment by spending money on public works like roads, bridges, dams and other projects - using expansionary fiscal policy. And while the economy recovered a bit, it soon required contractionary fiscal policy to right it again. But, by the start of World War II, FDR once again stimulated the economy through spending in 1943 and secured America's deliverance from the Depression. Since the early-to-mid 1900s, fiscal policy has been used by various administrations - sometimes successfully, sometimes not - to stabilize the economy. While the Trump administration continues to pass and propose new budgets and tax bills, the U.S. is currently running a deficit of $804 billion, with public debt sitting at $15.7 trillion, according to budget projections for the 2018 fiscal year from the Congressional Budget Office. As has been evidenced throughout the use of fiscal policy in America, both the legislative and executive branches of government have control over and are able to implement fiscal policy. And while President Trump's recent tax and budget bill seeks to boost the economy, some economists at the San Francisco Federal Reserve Bank are skeptical it will even have any affect whatsoever, according to the Wall Street Journal. S.F. Fed economists say the plan would go into effect during a time when the economy was already performing well, and would, therefore, not have the impact advertised by the administration. Furthermore, The Washington Post speculates the fiscal policy may benefit the wealthy more so than the middle class, according to reports this year. But while the benefits or effects on the economy of the newest "Tax Cuts and Jobs Act" of 2017 largely remain to be seen, fiscal policy continues to be a major management strategy for Congress to guide the economy through the ups-and-downs of the business cycle.